Leading Importer of rust oleum krud kutter tough task stain remover spray, rust oleum nano shield prefin additive, rust oleum nano shield prefin cleaner, rust-oleum wolman deck & fence brightener, krud kutter instant carpet stain remover deodorizer and rust-oleum krud kutter rust, calcium and lime stain remover from Jaipur. Weight 946 Ml Spray, 1.89 Ltr., 3.78 Ltr.,946 Ml Spray, 1.89 Ltr. and 3.78 Ltr. The most effective and safe all purpose remover available. No other single product removes really tough soils as quickly and effectively from so many different surfaces. Removes goo, gum, grease, and even dried latex paint and oil based paint splatters. Can be used full strength, or diluted with water for use on most indoor, outdoor, automotive, and marine surfaces. Excellent laundry stain remover—it's color fast and fabric safe. Pack Sizes LT/KG 237 Ml. Get significantly better adhesion and faster curing on refinishing jobs with Rust-Oleum® Nano Shield™ Hardener. Nano Shield Hardener is designed to allow Nano Shield™ Rapid Cure and Advanced Floor Finish to provide durability, accelerate cure time, and enhance adhesion to prefinished wood flooring. Provides durability Accelerates total cure from 10 to 4 days when used with Nano Shield™ Advanced Floor Finish (optional, not required). Provides adhesion to all tested laminate and prefinished flooring. Only compatible with Nano Shield™ Finishes. Finish/Hardener mixture must be used within 3 hours after activation. 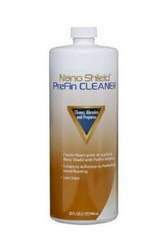 Must clean prefinished floors with Nano Shield™ PreFin Cleaner first. The first step to a professional floor-refinishing is Rust-Oleum® Nano Shield™ PreFin Cleaner. This low-odor, high-efficiency formula deep cleans and lightly abrades prefinished and laminate floors to ensure best-possible adhesion of the top coat. Prepares floors for top coat. Ideal for use prior to applying Nano Shield with PreFin Additive. Ensures great adhesion of top coat. Instantly brighten decks and other exterior wood with Rust-Oleum® Wolman™ DeckBrite™ Deck & Fence Brightener Wood Cleaner & Coating Prep. This 100%-biodegradable formula applies easily, clings to vertical surfaces and lifts dirt in just 10 minutes. Chlorine free, 100% biodegradable – will not harm plant life, damage wood lignin or leave a bleached-out look. Restores UV-grayed, dirty, mildew-stained wood surface to a bright, like-new appearance. Fast and easy to use - mix with water in less than 1 minute, does the job in 10 minutes! Weight 946 Ml Spray, 3.78 Ltr. Instant Carpet Stain Remover Plus Deodarizer leaves no sticky residue, so your carpet stays clean, fresh and soft. It is safe for all carpet types, including nylon and other synthetic carpets, as well as stain resistant carpets. Special surfactants penetrate deep into the carpet fibers to break up and eliminate dirt, grease, odors and stains. Special polymers repel dirt and stains so next time it’s easier to clean. Available Sizes: 946 Ml Spray, 3.78 Ltr. 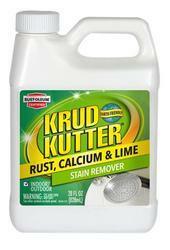 Krud Kutter Rust, Calcium, & Lime Stain Remover eliminates built-up rust stains and mineral deposits. This rust, calcium, and lime stain remover is perfect for tough stains in the bathroom, kitchen, garage, patio and all around the home. Tough on built-up mineral deposits & rust stains. Cleans & etches in one step. 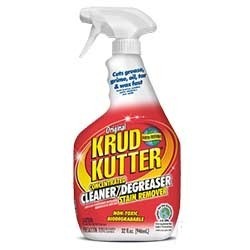 Krud Kutter Metal Clean & Etch is specially formulated to prepare iron, steel, zinc, aluminum, and galvanized surfaces for painting. Removes rust, oil, grease, and dirt. Eliminates paint peeling, and other adhesion problems. Do not mix this product with any other chemicals. Cleans and etches in one step. Prepares iron, steel, zinc, aluminum & galvanized surfaces for painting. Removes passivation film on galvanized surfaces, eliminating the need for sand-blasting prior to painting. RUSTEX is a rust inhibiting coating which converts rusted metal overnight into a rust retarding, paintable surface. When applied to rusted surfaces, iron oxide (rust) is chemically changed to iron phosphate, an inert, hard substance that turns the metal black. This increases the paint adhesion and durability of the coating. 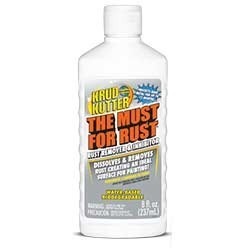 Unique rust remover and inhibitor. 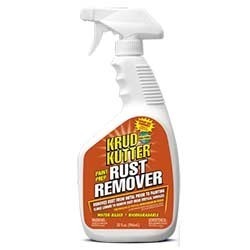 Removes and prevents rust in one step. Soak in or brush on application. Available Sizes 946 Ml Spray, 3.78 Ltr. Cleaner, degreaser, and stain remover. 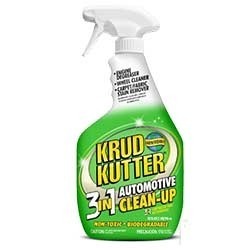 Krud-Kutter 3-IN-1 is a powerful, fast acting automotive cleaner/degreaser and stain remover. 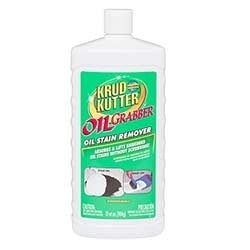 No other single product removes really tough krud as quickly & effectively from so many different surfaces. 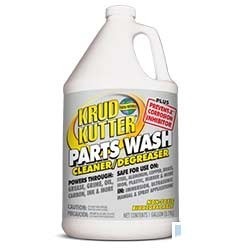 Great for degreasing engines, cleaning tools, tires, bumpers, headlamps, mats, fabric, vinyl seats, carpet, chrome, concrete floors, and fiberglass. How this automotive cleaner solves your multi-purpose? It is because it can be used for cleaning of Grease, Oil, Tar, Brake Dust, Oxidation, Bug Juice, Food Stain, Drink Stain and Pet Stains etc. Apply directly on area to be cleaned. Allow to penetrate for one minute. Scrub area clean with a cloth or brush. Rinse thoroughly with water, and dry with a clean soft towel. Repeat if needed. For wet spills on carpet/fabric, blot area with a clean, absorbent cloth. On dry carpet/fabric stains, spray soiled area, allow to penetrate, then gently rub with a cloth. Rinse with a clean damp cloth. Repeat as needed. PLEASE STAY ALERT: EYE AND SKIN IRRITANT. In case of contact with eyes or skin, flush with water for at least 15 minutes. If irritation persists, seek medical attention. If swallowed, take large amounts of water. Do not induce vomiting. Get medical attention. This product must keep out from the reach of children. For more information, visit the website of Truworth Homes (Official Indian Partner of Rust-Oleum). 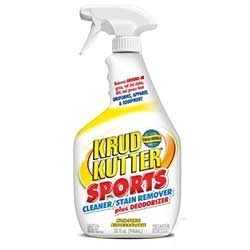 Krud Kutter Sports Cleaner / Stain Remover removes ground-in grass, red clay stains, dirt and grease from uniforms, apparel and equipment. Sports Cleaner / Stain Remover is color fast and fabric safe. It is ideal for difficult to clean sports uniforms, jerseys, athletic apparel, and all equipment. Also ideal for cleaning tough stains, such as dried latex paint, from work clothes. Deodorizes as it cleans and helps deter future odors. Contains brightening agents to keep uniforms looking like new. Removes tough, ground-in stains from grass, red clay, blood, sweat, dirt, grease, oil, mud, and food spills. Even removes stains from coffee, cola, red wine, spaghetti sauce, shoe polish and more. Works great on pet stains and odors. Red Clay Stain Remover is a ready-to-use formula that safely and easily removes red clay stains from interior and exterior surfaces. Color fast, fabric safe. Water-based, biodegradable. Safe - Fast – Effective. 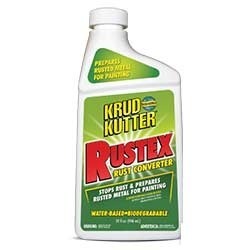 Krud Kutter Rust Remover is a proprietary formulation that penetrates into the voids of a metal surface and dissolves rust and oxidation through chemical action. Cleaning time will vary according to the severity of the rust. Medium to light rust will be dissolved in 10 minutes or less, while heavier deposits may require a second application. Rust Remover is recommended for cast iron, stainless steel, aluminum, galvanized, chrome and brass. Available Size: 32 Oz. Spray (946 ml). Outperforms conventional liquid degreasers. Absorbs and lifts embedded oil stains without scrubbing. The only product proven effective on concrete. Also works on asphalt, composite/wood decks, patios, pavers and more. Absorbs and lifts embedded oil stains as it dries from liquid to powder. Restore color to faded or worn seats, dashboards, door panels, carpets and more with Rust-Oleum's easy to use sponge applicator. This convenient delivery system requires little to no masking. Convenient, no mess paint delivery right where you want it. Adheres to carpets, seats, dashboards, door panels and more. Flexible Coating will not get brittle, crack or degrade. Light stable, will not yellow/discolor. No Peel Promise, adhesion guarantee. Clean surface with mineral spirits, using a clean cloth to dry the surface. When dry, follow with soap and water, rinse thoroughly and dry with a clean cloth. Mask surrounding area to protect from drips and spills. Drips and spills should be cleaned before paint is dry to the touch. Use water or a rag saturated with rubbing alcohol. Clean sponge applicator by immersing in hot water. Replace the cap tightly and store bottle upright. NOTE: Do not allow the paint to freeze. How the surfaces should be prepared before applying? NOTE: Read and follow all the instructions carefully printed on tin before using. Quantity Per Pack 3.78 Ltr. 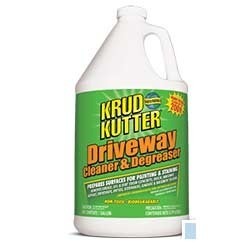 Driveway Cleaner & Degreaser is a major breakthrough in driveway cleaning technology. The proprietary formulation contains "Oil Grabber", a unique additive which penetrates the surface to dissolve tough stains from grease, oil, algae, mildew, and dirt. It also prepares surfaces for finishing by promoting the adhesion of paint, stain, and sealers. Parts Washer Cleaner & Degreaser is a safe alternative to hazardous cleaning chemicals such as mineral spirits and other solvents. This multi-purpose formula is designed to be used in immersion, ultrasonic, manual, and spray applications. Safely and effectively removes grease, grime, oils, carbon, ink and other organic deposits. 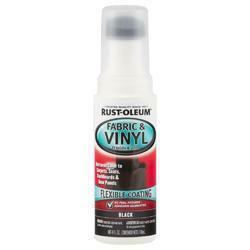 Keep wood and laminate surfaces looking their best with Rust-Oleum® Varathane® All Purpose Wood Cleaner. 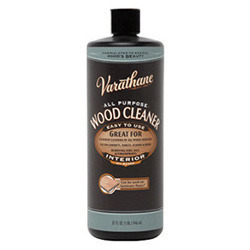 Regular use of this general-purpose cleaner will help protect and preserve wood surfaces—without the soapy residue other cleaners leave behind. For everyday cleaning of all wood surfaces. Safely removes dirt, oils and fingerprints. Can be used on hardwood, factory finished and laminate floors. Great for all wood surfaces such as floors, cabinets and tables etc.